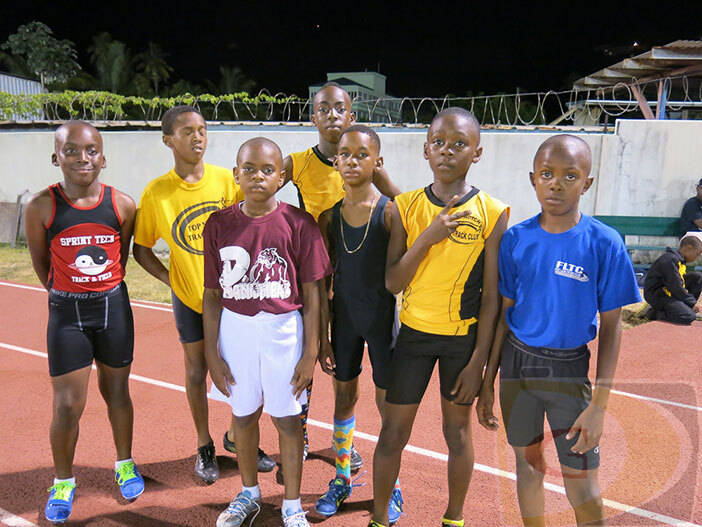 MAY 6—Although bad weather delayed the Day II start in the LIME National Youth Championships on Saturday morning, resulting in the merging of a session, it did not deter the athlete’s competitive spirit that began on Friday night. The competition, which also celebrated the IAAF’s World Athletics Day, attracted the territory’s top Under 15 athletes who represented four clubs and 12 schools—Top Notch, Sprint Tech, Fast Lane, Raw Skillz, Willard Wheatley, Isabella Morris, Alexandrina Maduro, Robinson O’Neal, Pelican Gate, Joyce Samuel, Ivan Dawson, Enis Adams, Francis Lettsome, First Impression, Althea Scatliffe and Elmore Stoutt High School. Elmore Stoutt’s Leshaun Lindo derailed versatile Jelani Norman’s plans for U15 Boys 100m glory, after Norman posted the fastest time of 12.30 seconds in the prelims, to Lindo’s12.39 in his heat. Lindo won the final in 12.40 to Norman’s 12.45. Norman would later fend off Joshua Hill’s late 400m charge to win by .10 in 57.29 seconds, after cutting the sand at 5.57m in the Long Jump for his double. Fast Lane’s Zara Brown secured an U13 Girls sprint double ahead of teammate D’Neigh Williams and Top Notch’s Xiomara “Gia” Malone, winning in 13.68 and 27.61 seconds respectively. Williams was .001 faster than Malone in the 100 as both ran 13.88. They finished in the same order in the 200m. Fast Lane’s J’Quaan Smith bested Koen Penn by .03 in the U13 Boys 100m to win in 13.40 seconds and picked up the double when he cut the 200m tape in 27.70. Top Notch’s Penn dashed Smith’s hopes for a third victory when he out jumped Smith—who finished third in the Long Jump—4.58m-4.32. Magloire and Sprint Tech’s Aryah Smith respectively, was foiled by Raw Skillz’s Kealyah Liburd in the Long Jump whose 3.84m measurement was 2cms better than Frett’s mark. On the Boys side, Top Notch’s Kyron Walwyn overhauled teammate Kybah Dawson in the closing stages of the 200m to complete his 100/200m double with times of 14.02 and 29.04 seconds respectively. He finished behind Dawson and Sha’eel Lavacia in the Long Jump to miss the treble. Their teammate Lavacia was second in the 100m. Althea Scatliffe Khaleem Lettsome won both the U9 Boys 80 and 150m in 12.45 and 23.61 seconds to overhaul teammate Johari Lacey both times and completed his treble against Lacey by winning the Ball Throw with a distance or 25.75m.